Windows 10 has many new commands as well as a different look from the previous versions. This confuses many users as to how to find or change certain aspects on their computer. 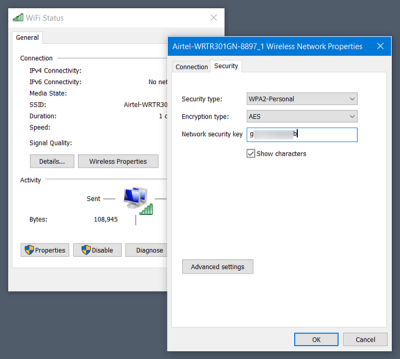 If you too are wondering how to find Wi-Fi password on Windows 10. How Do I Find Wi-Fi Password on My Windows 10 Computer? It is possible to forget the password to your Wi-Fi network. Or maybe someone in the family has changed the wireless password and now does not recall what it was. At such times, it is easy to find the wireless password using the Control Panel or the Command Prompt. If you are using Windows 10 then you need to follow the steps explained below. Using WinX Menu go to the Control Panel -> Network and Sharing Center. You will find a WiFi link that you need to click on. On clicking the link a WiFi Status box will open where you need to click Properties. Open the Wireless Network Properties and go to the Security tab. Here, you need to click on Show characters check-box and you will be able to see your Wi-Fi password next to the Network security key column. In place of In place of YOUTWIFINAME you need to type the name of your wireless connection, that is, SSID. Hit Enter and you will see the WiFi password under Security setting > Key Content. This is all you need to do to find WiFi password in Windows 10.